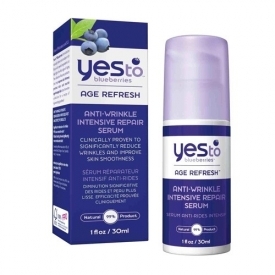 Yes To Blueberries Age Refresh Anti-Wrinkle Intensive Repair Serum acts as a powerful "vitamin layer" applied directly to clean skin. It can be used both morning or evening. This powerful blend combines organic cotton thistle which is clinically proven to restore and repair age-damaged skin in 7 days, along with anti-oxidant rich blueberries and blackcurrant, which is rich in essential fatty acids to help nourish and soothe skin. Your skin is left feeling oh-so-glowy! - 95% saw an improvement in skin smoothness. - Skin left significantly more moisturised in clinical testing. - Significant reduction of wrinkles and frown lines. *% of users in self-evluation in 28-day test. Directions for use: Apply Yes To Blueberries Age Refresh Anti-Wrinkle Intensive Repair Serum evenly to face and neck both morning and night, and get ready for even, glowing, superhero skin! For best results, follow with moisturiser. - Blueberries are rich in Anti-oxidants such as Vitamin C and Anthocyanins to help fight the formation of free radicals that can damage the skin's microstructure. - Organic Cotton Thistle hydrates age-damaged skin and helps boost natural collagen production and skin rejuvenation. Clinically proven to promote skin repair in 7 days. - Blackcurrant is rich in Anti-oxidants and Essential Fatty Acids to help nourish and soothe skin. - Apples are rich in powerful Polyphenol Anti-Oxidants and natural Alpha Hydroxy Acids, which help to refresh and brighten skin's surface. 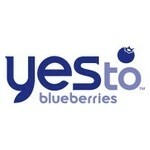 Vaccinium Cyanococcus (Blueberry) Juice, Water, Aloe Barbadensis Leaf Extract, Glycerin, Avena Sativa (Oat) Kernel Oil, Alcohol, Xanthan Gum, Onopordum Acanthium (Cotton Thistle) Flower/Leaf/Stem Extract, Pyrus Malus (Apple) Fruit Extract, Ribes Nigrum (Black Currant) Seed Oil, Simmondsia Chinensis (Jojoba) Seed Oil, Oryza Sativa (Rice) Bran Extract, Lecithin, Phenethyl Alcohol, Glyceryl Caprylate, Fragrance.